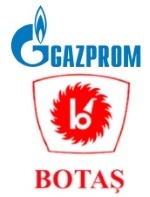 édité le 28/05/2018 - Plus de news de "GAZPROM" - Voir la fiche entreprise de "GAZPROM"
Petroleum Pipeline Company (BOTAS) was established based on the Decree No. 7/7871 with the purpose of tranporting Iraq’s crude oil to İskenderun Bay, in accordance with the Crude Oil Pipeline Agreement signed between the Governments of the Republic of Turkey and the Republic of Iraq on 27.08.1973. BOTAS was restructured as a State Owned Enterprise based on the Decree of the Council of Ministers No. 96/6526 dated 08.02.1995. BOTAS, subject to the Decree Law No. 233, established according to the provisions of private law is a State Owned Enterprise with a joint-stock company status.